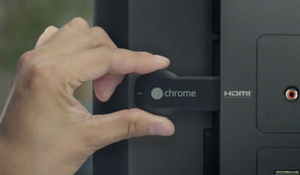 Google's popular $35 HDMI dongle Chromecast has just seen its largest expansion yet, ten new applications. Until now, the Chromecast only supported Netflix, HBO Go, Pandora, YouTube, Hulu Plus and Google Play Movies, TV and Music. And for those many holiday gatherings, you can also cast your personal media straight to your TV using Plex, Avia, or RealPlayer Cloud apps. There's no need to huddle around small screens when you can share your own photos and videos using your phone, tablet, or laptop. Plex is likely the biggest addition of the bunch, as Chromecast fans have been clamoring for a way to stream their local content better. k....I have no interest in any of those. Would love them to add Amazon streaming...seems like a lot of these devices have all these options I've never even heard of. Gotta be a lot of Amazon users out there though I'd think. Wonder why they haven't added it? I bought one when it first came out, and I've been very disappointed. While it functions reasonably well for what it does, I figured that since it was Google, it would be reasonably open-sourced and there would be some great app development so that I could eventually watch local content. But instead, Google has been very restrictive in app development, and the only local content options are these new heavily-hobbled apps that the article describes. Very disappointed. I literally had a Chromecast in my shopping cart last night, but after seeing the Roku LT for $13 more on Walmart's site, I went with that for my gifting needs. Personally, I pay a bit more for one of the Android mini-PCs that are widely available for about the same price as the Roku. I have a Rikomagic that is somewhat wonky at times, but I have far greater access to apps than even the upgraded CC does, and despite the wonkiness, the video playback on it has always been solid. Poor thinking Google...should've included the Play store, then you would've blown everyone else out of the water. Soz, what did you end up getting the Roku or what? I ended up getting the Roku box only because the people I'm getting it for are not really all that tech-savvy, and it'll be good enough for their needs vs. the Android PC. My Rikomagic took a small amount of tweaking to get it to work properly, and though I wouldn't mind helping them, I think they'd be more comfortable with the Roku. I've been using the OUYA myself. Ah...how's it working for you? I was an early backer, but was greatly disappointed after FINALLY receiving it (yes, shipping delays were part of the issue). Once I found out you'd be locked out of the OUYA store after rooting it was a huge turnoff for me, and the flimsiness of the controller was the final straw. I haven't rooted it because I haven't felt the need. The updates have improved things A LOT. Games are improving, e.g. The Cave is available now for $5. I use it a lot for AV (2-chan only, not sure if HDMI pass-thru works yet). I use a variety of players so it's rare to find a file that I can't play. Even 1080p. I don't have any problems sideloading most stuff. It networks. BT works fine for mouses, KBs etc. It's been a while now so I've forgotten about the longish wait for it. Concerning the controller; the touchpad failed shortly after getting it so they sent another post haste, it's worked fine... Apart from that, although I find the triggers a bit squeaky, I like the distinctive look and feel of the OUYA controller, esp. the coolness of the aluminium handles, I mean literally cool to touch. I think they are bringing out a new controller but I'm not bothered. The OUYA's not bad. I guess my expectations for $99 were different from yours. I think it's only logical that you'd lose access to the store as it's written into their OS version... At least the OUYA's is well supported. You can install games to a USB stick/drive now btw. I just got a Roku 3 as a Christmas gift and having the Chomecast and the Roku I gotta say the Roku is way better (right now). Will keep both and see what happens. I usually just slip my fingernail around the side seam to pop the covers off.